These cookies are open to your own imaginative interpretation. 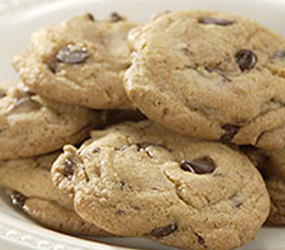 Try butterscotch chips and toasted salted pecans, or white chocolate and cranberries, in place of the chocolate chips. Hands-on time: 12 mins. to 17 mins. Baking time: 9 mins. to 11 mins. Total time: 1 hrs 30 mins. to 2 days 33 mins. 1) Beat the butter, sugars, vanilla and salt till fluffy. 2) Beat in the eggs one at a time, being sure to scrape down the sides and bottom of the bowl midway through to make sure everything is well combined. 3) Whisk together the flour or flour blend, xanthan gum, baking powder, and baking soda. 4) Beat the dry ingredients into the butter mixture, then blend in the chocolate chips and nuts. Again, scrape the bottom and sides of the bowl to be sure everything is well blended. 5) Cover the bowl and refrigerate for 1 hour, or for up to 2 days. 6) Preheat the oven to 350°F. Lightly grease a couple of baking sheets, or line with parchment. 7) Scoop tablespoon-sized balls of dough onto the prepared baking sheets; a tablespoon cookie scoop works well here. Leave space between the cookies so they can spread. 8) Bake the cookies for 9 to 11 minutes, until golden brown. Remove from the oven and let rest on the baking sheets for 5 minutes, to set, before transferring to racks to cool completely. Or allow them to cool right on the baking sheets. The cookie dough needs to be refrigerated for at least 1 hour before baking (or for up to 2 days), so plan accordingly. Dough may be scooped into balls, wrapped well, and frozen for up to several months. For hot homemade cookies, FAST, simply place frozen dough balls on a baking sheet, and bake for a minute or so longer than the directions indicate. These cookies stay nice and fresh for a day or so after baking. Freeze for longer storage.